I've always had problem skin, which my can't live without skincare post will back up but add dodgy sensitive/highly allergic skin which makes finding skincare that works for me can be even more hard work. I'm also not ashamed to say that I have three (yes three) moisturisers which I use on a regular basis to stop my skin from drying out completely. This is the cream that I use every day and night to provide my skin with the necessary moisture it needs. It's a nice thick moisturiser which sinks into the skin and the added bonus is the factor 15 SPF which is in there too. It means that on sunny days (a rarity up here in Glasgow) or on holiday I don't need to worry about sun cream on my face. When it comes to packaging the moisturiser is in a tub which is helpful as you can then see exactly how much of the product you are using at any one time and also, more importantly, how much is left. It's priced at £13.50 for one tub, but it does last for around six months which I feel is pretty good value for money. I was first introduced to this moisturiser by the Tesco marketing campaign where people could gift each other either and the choice was this moisturiser or a mascara. 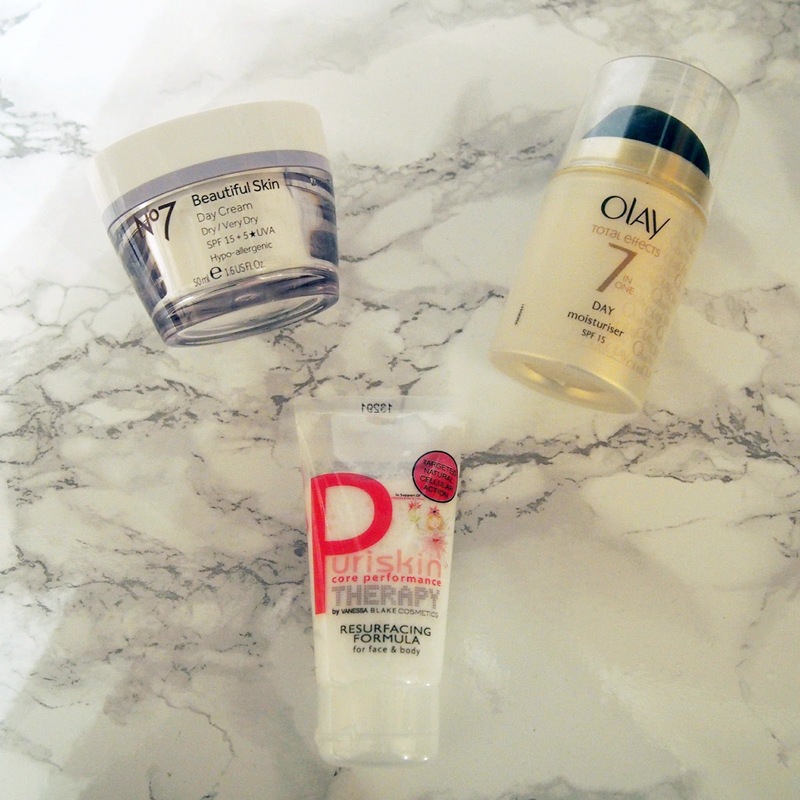 I chose the Olay moisturiser and I'm so glad I did. I used to use the Olay Complete Day Fluid but after a bad allergic reaction had to give away the stock of it I had built up. Olay Total Effects has become my go to moisturiser for during the day when I feel I need to add some extra moisture to my skin but not as much as the No7 provides. It's also a lot lighter to carry around should I feel I need to. I'm not too keen on the pump for getting the product out, as somehow I usually end up with a bit too much that then ends up being used as a hand cream too. At around £15 for a tub it is fairly expensive but lasts me a long time and you can often pick it up in a supermarket on special offer. My skin seems to have developed a distinct dislike to being washed in the shower, which is a shame for my poor Magnitone which seems to now be gathering dust. However, I am a sucker for giving my face a good exfoliation when I'm in the shower and as a result, the resurfacing formula has become one of my holy grail products. It was included in a Blogger Beauty Box and is now indispensable to me. It calms down the redness I experience but is also handy for any patches that become itchy anywhere else on my body. This is a tube rather than a pump or jar which I find useful as I'm often using the Puriskin in small quantities. Again, its over the £10 mark but for a moisturiser that fixes my skin this is a small price to pay and I will be purchasing more when this tube is done.